Paulo Costa Carvalho holds a PhD in systems engineering and computer science from the Federal University of Rio de Janeiro and is a former member of the John R. Yates Laboratory at the Scripps Research Institute, California, EUA. Among his awards, we highlight the Google Award for Academic Excellence and the Young Biochemistry Scientist Award given by the Brazilian society for biochemistry and molecular biology (SBBq). In 2012 he earned a position as a research scientist in proteomics at Fiocruz, Brazil’s federal consortium of research institutes under the Ministry of Health. Paulo has published over 60 papers of which several of his first / last author papers are in distinguished journals such as Bioinformatics, Analytical Chemistry, Molecular and Cellular Proteomics, Nature Protocols, and Nature Methods. 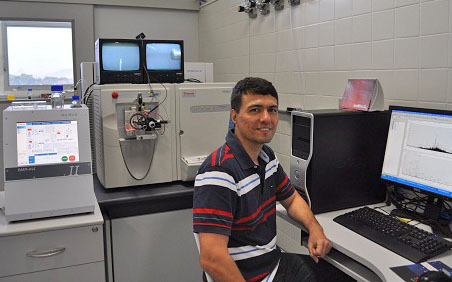 In 2014 he became accredited into the highly competitive group of researchers officially sponsored by Brazil’s Research Council, owing to the high quality of his publications in the fields of proteomics and computational mass spectrometry (pesquisador de produtividade CNPq). Paulo is a member of the faculty at the Federal University of Rio de Janeiro and Carlos Chagas Institute, Fiocruz, where he teaches computational proteomics at the graduate level. Paulo is founding member of the Brazilian Society for Proteomics and is part of its scientific committee. In October 2014, Paulo was nominated as an executive editor of the Journal of Proteomics (IF 3.9) which is the official journal of the European Proteomics Association. Recently, in 2016, he became part of the Features Panel of the prestegious Analytical Chemistry (IF 5.8) journal.